Luxfer’s lightweight carbon composite cylinders can be found across numerous aerospace and inflation applications, including emergency egress slides for commercial aircraft, helicopter utility float systems, and various life raft products. 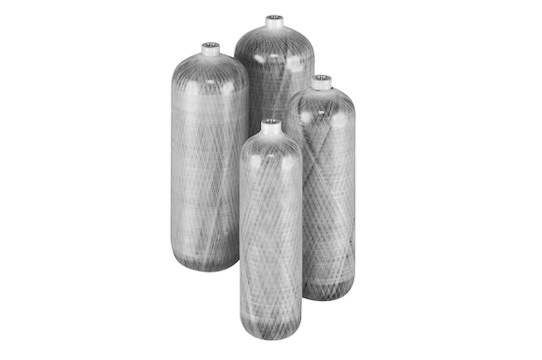 Available in sizes ranging from two liters water volume to nearly 90 liters, Luxfer’s high-pressure inflation cylinders ensure the reliable and rapid deployment of life safety systems where every second counts. A Luxfer inflation cylinder is constructed of a corrosion-resistant thin-walled AA6061 aluminum liner overwrapped in high-strength carbon and glass fibers. An AmSafe slide deployment. Slide contains Luxfer inflation cylinders. Video courtesy of AmSafe Aviation. Manufactured at our Riverside, California, facility, all our inflation and aerospace cylinders are designed to requirements of the U.S. DOT-CCFC and meet all performance provisions of the Federal Aviation Administration (FAA) and related Parts Manufacturer Approval (PMA).